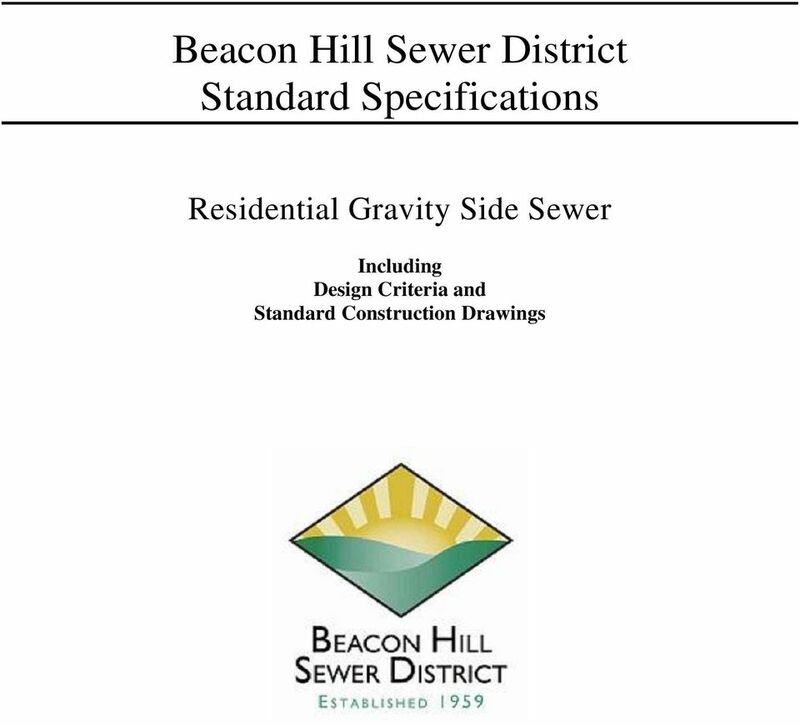 Download "Beacon Hill Sewer District Standard Specifications"
2 Residential Gravity Side Sewer Design Criteria 1. Provisions A. 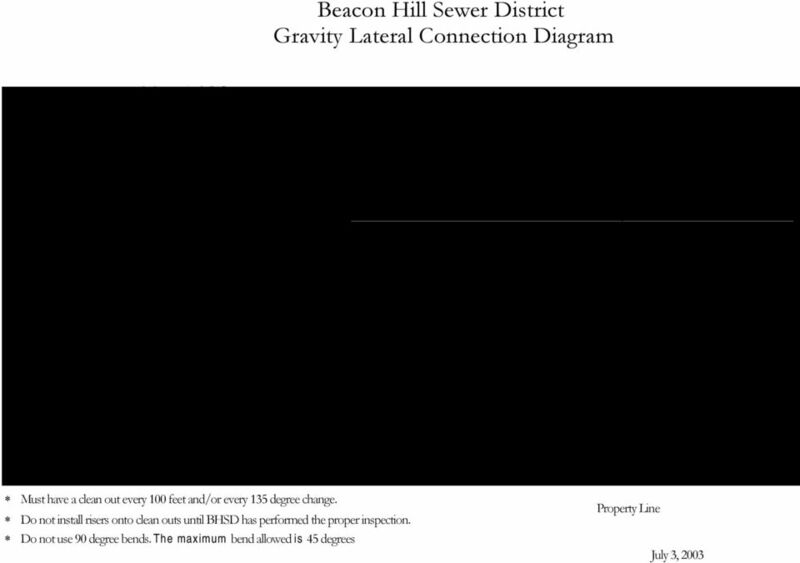 It shall be unlawful to construct, extend, relay, repair, and make connection to or the disconnection of any side sewer inside the property line without contacting the District. A determination will be made upon that contact as to whether a permit shall be required for the work to be done. B. 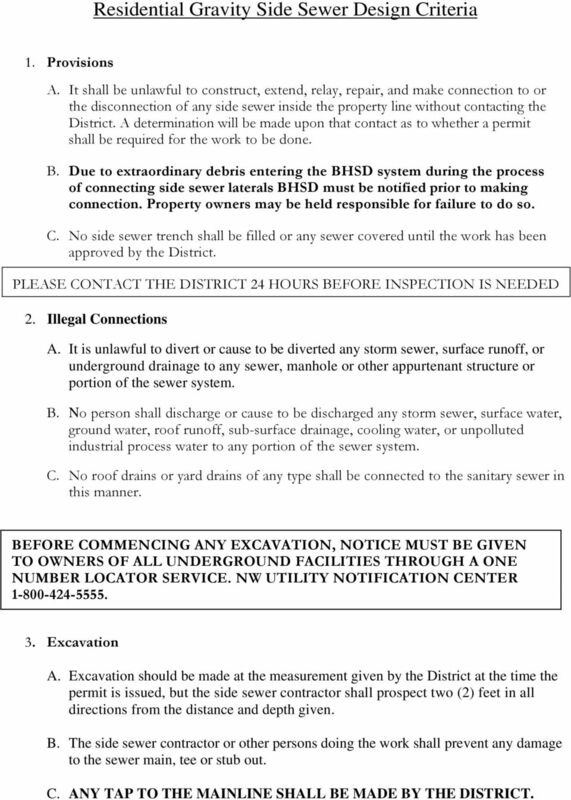 Due to extraordinary debris entering the BHSD system during the process of connecting side sewer laterals BHSD must be notified prior to making connection. Property owners may be held responsible for failure to do so. C. No side sewer trench shall be filled or any sewer covered until the work has been approved by the District. PLEASE CONTACT THE DISTRICT 24 HOURS BEFORE INSPECTION IS NEEDED 2. Illegal Connections A. It is unlawful to divert or cause to be diverted any storm sewer, surface runoff, or underground drainage to any sewer, manhole or other appurtenant structure or portion of the sewer system. B. No person shall discharge or cause to be discharged any storm sewer, surface water, ground water, roof runoff, sub-surface drainage, cooling water, or unpolluted industrial process water to any portion of the sewer system. C. No roof drains or yard drains of any type shall be connected to the sanitary sewer in this manner. BEFORE COMMENCING ANY EXCAVATION, NOTICE MUST BE GIVEN TO OWNERS OF ALL UNDERGROUND FACILITIES THROUGH A ONE NUMBER LOCATOR SERVICE. NW UTILITY NOTIFICATION CENTER Excavation A. Excavation should be made at the measurement given by the District at the time the permit is issued, but the side sewer contractor shall prospect two (2) feet in all directions from the distance and depth given. B. The side sewer contractor or other persons doing the work shall prevent any damage to the sewer main, tee or stub out. C. ANY TAP TO THE MAINLINE SHALL BE MADE BY THE DISTRICT. 3 D. Manholes shall be accessed by District personnel only. 4. Trench Safety A. 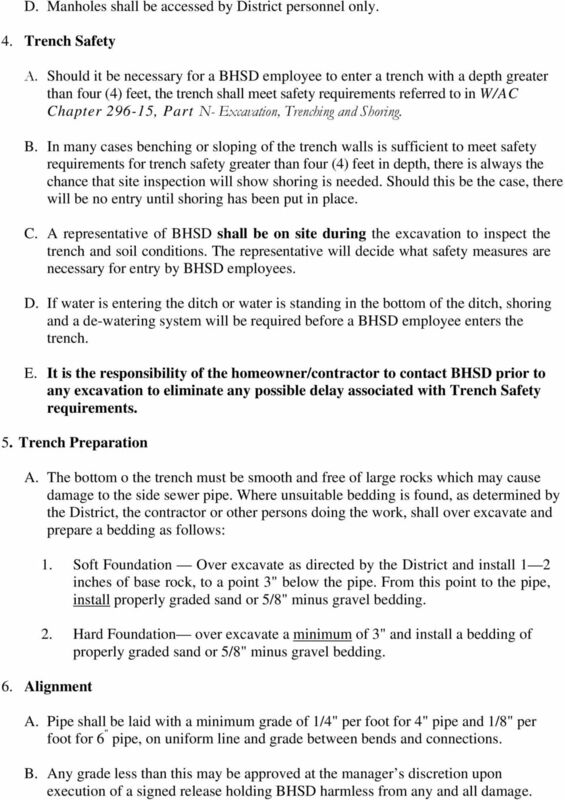 Should it be necessary for a BHSD employee to enter a trench with a depth greater than four (4) feet, the trench shall meet safety requirements referred to in W/AC Chapter , Part N- Excavation, Trenching and Shoring. B. In many cases benching or sloping of the trench walls is sufficient to meet safety requirements for trench safety greater than four (4) feet in depth, there is always the chance that site inspection will show shoring is needed. Should this be the case, there will be no entry until shoring has been put in place. C. A representative of BHSD shall be on site during the excavation to inspect the trench and soil conditions. The representative will decide what safety measures are necessary for entry by BHSD employees. D. If water is entering the ditch or water is standing in the bottom of the ditch, shoring and a de-watering system will be required before a BHSD employee enters the trench. E. It is the responsibility of the homeowner/contractor to contact BHSD prior to any excavation to eliminate any possible delay associated with Trench Safety requirements. 5. Trench Preparation A. The bottom o the trench must be smooth and free of large rocks which may cause damage to the side sewer pipe. Where unsuitable bedding is found, as determined by the District, the contractor or other persons doing the work, shall over excavate and prepare a bedding as follows: 1. Soft Foundation Over excavate as directed by the District and install 1 2 inches of base rock, to a point 3" below the pipe. From this point to the pipe, install properly graded sand or 5/8" minus gravel bedding. 2. Hard Foundation over excavate a minimum of 3" and install a bedding of properly graded sand or 5/8" minus gravel bedding. 6. Alignment A. Pipe shall be laid with a minimum grade of 1/4" per foot for 4" pipe and 1/8" per foot for 6 " pipe, on uniform line and grade between bends and connections. B. Any grade less than this may be approved at the manager s discretion upon execution of a signed release holding BHSD harmless from any and all damage. 4 7. Materials A. Pipe and fittings must be PVC Schedule 3034 or ABS Schedule 40, with solvent weld or rubber casketed joints. B. NO 90 DEGREE FITTINGS ARE ALLOWED. 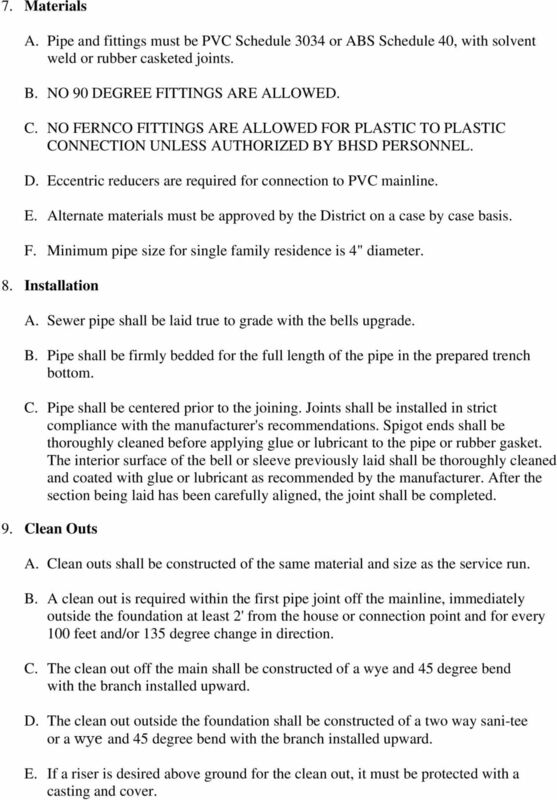 C. NO FERNCO FITTINGS ARE ALLOWED FOR PLASTIC TO PLASTIC CONNECTION UNLESS AUTHORIZED BY BHSD PERSONNEL. D. Eccentric reducers are required for connection to PVC mainline. E. Alternate materials must be approved by the District on a case by case basis. F. Minimum pipe size for single family residence is 4" diameter. 8. Installation A. Sewer pipe shall be laid true to grade with the bells upgrade. B. Pipe shall be firmly bedded for the full length of the pipe in the prepared trench bottom. C. Pipe shall be centered prior to the joining. Joints shall be installed in strict compliance with the manufacturer's recommendations. Spigot ends shall be thoroughly cleaned before applying glue or lubricant to the pipe or rubber gasket. The interior surface of the bell or sleeve previously laid shall be thoroughly cleaned and coated with glue or lubricant as recommended by the manufacturer. After the section being laid has been carefully aligned, the joint shall be completed. 9. Clean Outs A. Clean outs shall be constructed of the same material and size as the service run. B. A clean out is required within the first pipe joint off the mainline, immediately outside the foundation at least 2' from the house or connection point and for every 100 feet and/or 135 degree change in direction. C. The clean out off the main shall be constructed of a wye and 45 degree bend with the branch installed upward. D. The clean out outside the foundation shall be constructed of a two way sani-tee or a wye and 45 degree bend with the branch installed upward. E. If a riser is desired above ground for the clean out, it must be protected with a casting and cover. 5 F. BHSD has the discretion to require the clean out at the foundation to be raised based on the length of the lateral or the site conditions. G. DO NOT GLUE RISERS INTO ANY CLEAN OUT PRIOR TO BHSD LATERAL INSPECTION AND AIR TEST. 10. Backfill Trench A. After the line has passed the 4 psi air test and the installation has been diagrammed by BIISD personnel, the line shall be bedded and backfilled in a manner which will prevent damage to the pipe. B. Keep rocks and large debris away from the surface of the pipe to prevent long term damage.